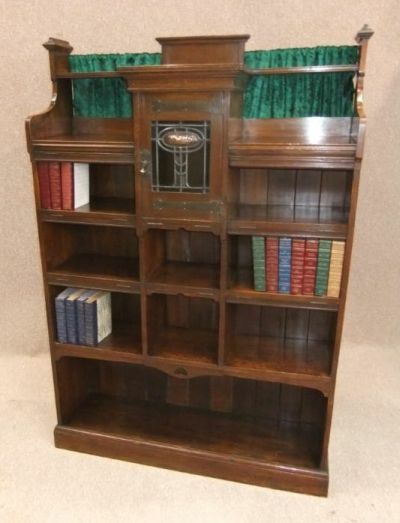 A magnificent Victorian, solid oak, arts and crafts bookcase; featuring varying sized shelves, all fitted with original hinged dust protectors. There is a central cupboard fitted with a leaded glazed door fitted with a copper panel. The bookcase is decorated with a green chenille backdrop. An extremely unusual and elegant piece of arts and crafts furniture with plenty of storage for books, DVDs etc. This arts and crafts oak bookcase is an ideal piece of furniture for any period property. The item is in lovely condition, but does have a few old water marks, however, no major damage.